You have now entered all the information needed to process your purchase. Please verify the information is correct and when you are ready to make your purchase and authorize payment with the selected payment means, press Complete Purchase to send your order to Aurora Systems for processing. Note: Before you continue, you must have an active internet connection. This is the Ship To address you entered. This is the Bill To address you entered. This is a summary of the products you have selected to purchase. This is the shipping method you have selected. This is the means of payment you have selected. This is the currency that your order will be processed in. This is the total of your order including all shipping charges and taxes and the amount that you will be billed for this purchase. Warning: This is your last chance to cancel this purchase. Once you press this button, your order will be processed. Press this button to confirm your selections and send your order to Aurora Systems for processing. 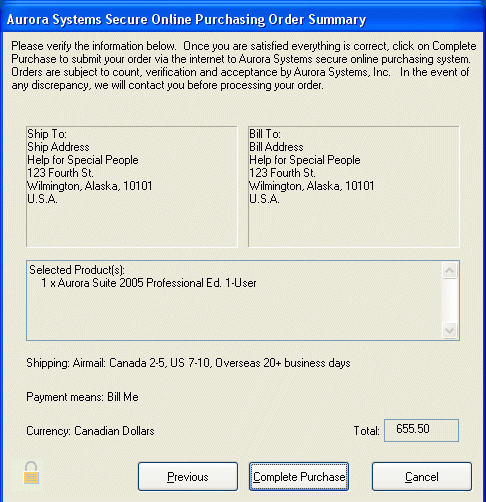 By pressing this button, you are authorizing Aurora Systems or its suppliers to process your order and payment with the selected payment means.